After the walk, Alice showed us a few simple book-binding methods that she uses for us to try out on our samples. I pulled out all of the bit which I thought had actually worked ok – about half I would say, which isn’t bad for experimenting. I themed them into books based on the different ‘places’ which we had visited over the week: the buttercup meadow, the railway, the village, the hedgerows. Overall it has been a really marvellous week, and I am really glad I got the chance to meet Alice and see her methodology first hand. Courses like this are also made by the people you are with – we had a lovely bunch of ladies working away, and our studio chief Jude looked after us so well (very good food and cake everyday!). I will take a few days to reflect on what we have done and what learning I can take back into my MA project. I would like to understand how such direct responsiveness to a specific place can become something more than just a record of personal experience. Later though, for now I am thinking about nothing other than the sofa! 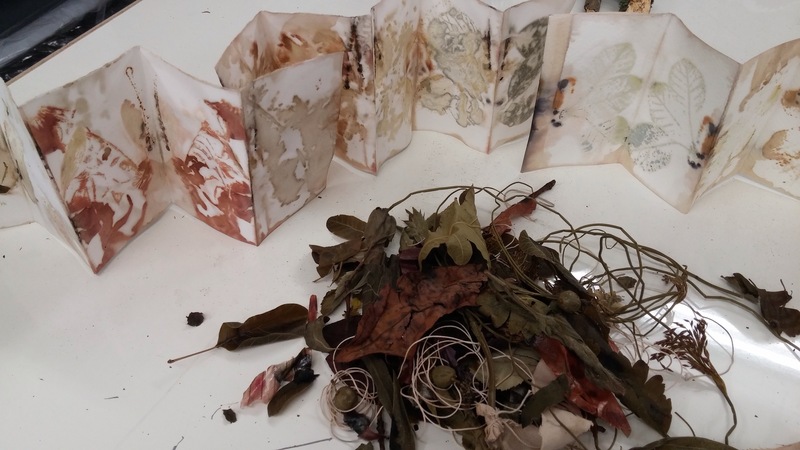 This entry was posted in 03.5 Unit 1 experiments, 04.3 Materials and process and tagged alice fox, bookbinding, natural dyeing, place on 26 June,2015 by antalbot. The excitement continued today with experiments using printing techniques as the backbone. We started the day with another walk where a few of us ventured out into a beautiful meadow edged with thick woodlands, spending an hour or so watching, listening and drawing. Not doing so well on the collecting, but part of me feels bad for picking things up moving them out of context into the shiny whiteness of the studio. We played with two printing techniques once back in the studio – direct transfer printing from the botanicals and using a pasta machine as a miniature printing press. We also used some of the rust dyed strips from yesterday to overprint onto – giving some lovely results. My absolute standout favourite was using the pasta machine for embossing – I’ve never done this and the clean crisp lines of white on white (no ink whatsoever) really appeals. Alice also gave us some little ideas which we could use as starting points – today I focussed on trying to translate sounds into imagery. I did end up back into drawing with words again (both Anita and Maiko would laugh at my predictability here) but I can’t seem to help myself. I need to try to exploit this I think rather than endlessly fight it. Overall thoughts – it was a great sunny summer’s day, and very useful to learn the techniques. I think it’s getting clear in my mind that I don’t really get on with directly using the nature forms (leaves etc) in my work as I keep trying to go more abstract. I really liked the translation of movement (a journey) into line, and my attempt at capturing the genius loci of a meadow (bottom three strips in the image above). 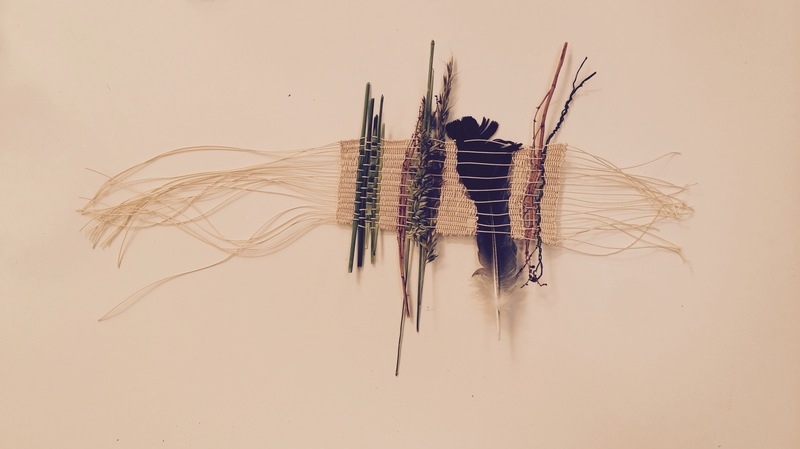 This entry was posted in 03.5 Unit 1 experiments, 04.3 Materials and process and tagged alice fox, meadow, natural dyeing on 24 June,2015 by antalbot. A new series of work…. …I am quite pleased with this new series, and very intrigued about where it could take me. My research has been focussing on using natural dyeing processes as a way to explore the boundaries between material, place and time. I have been using stochasic processes – i.e. those with a random element which cannot be completely constrained, creating an interesting conversation between between the material and maker. 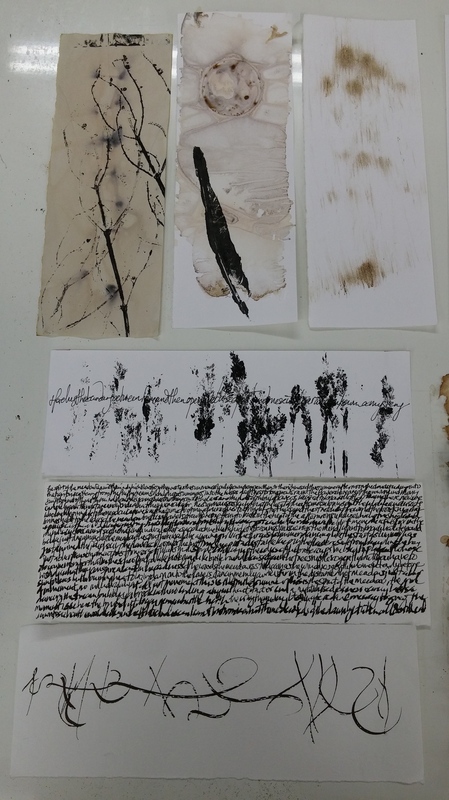 For these pieces (which for lack of any other description I am calling ‘fabric drawings’), I have used collected English wildflowers, plants and tree bark to create texture, using the environment itself as part of the mark-making process. These first pieces have both been rain-dyed. I am exploring a couple of different debates with this work, both centred around my ideas on ‘local knowledge’. Firstly, using handmade plant dyes and pigments, the work explores how the evolution of natural colour, rarely lightfast, allows us to question the relationship between knowledge of place and permanence. Secondly, constraining the natural sculptural movement of the textiles onto the frame, engages us in a discussion of how we balance freedom and constraint of local knowledge. This entry was posted in 03.5 Unit 1 experiments, 04.3 Materials and process and tagged abstract art, natural dyeing on 2 June,2015 by antalbot. I’m taking my natural dyeing experiments up a level with some long term projects, using more radical transformation processes. Exciting! Today’s experiment was with using managed decay to mark and texture a sheet of fabric – still using my unbleached calico. 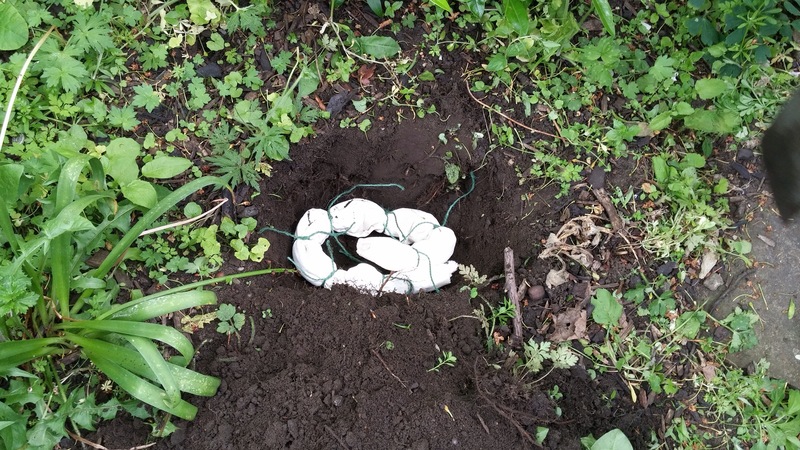 The fabric was wrapped into a little bundle with a series of natural dyestuffs from a local herbalist, the buried into the soil for at least a month, possibly two. 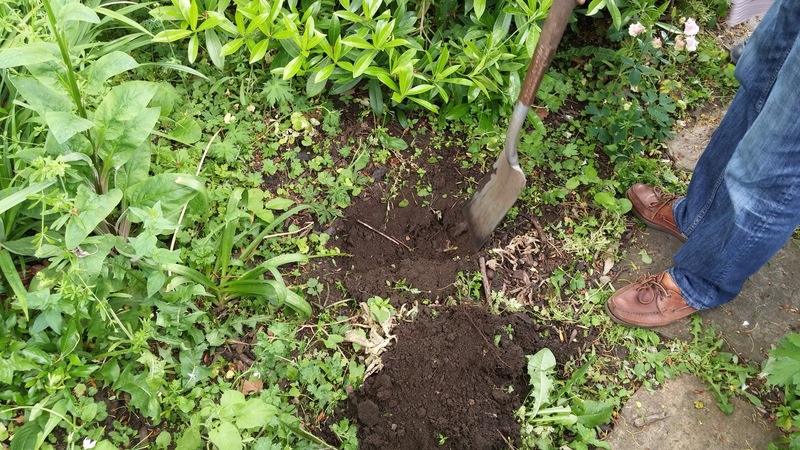 I think this may need a while to react to the dampness and minerals in the soil – I wonder how much patience I have to wait! 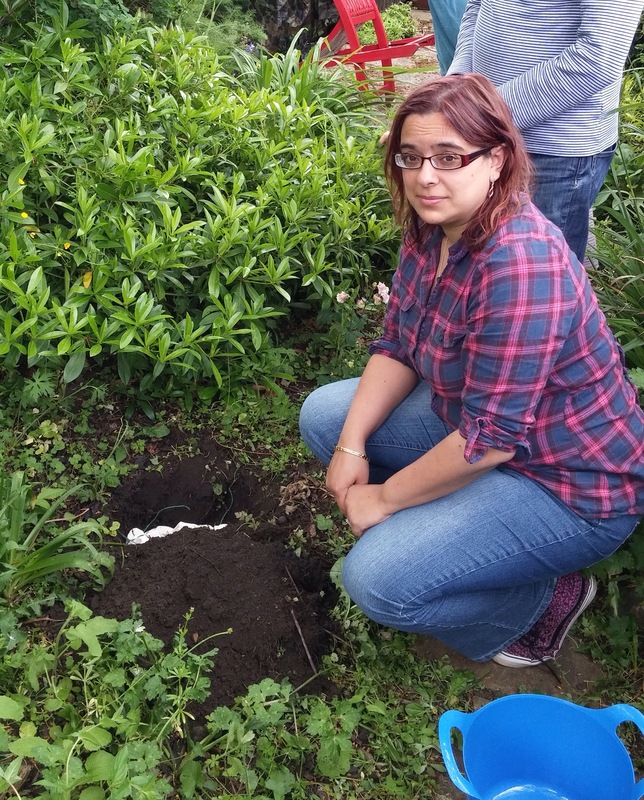 This was the digging of the hole and the little bundle being abandoned to the ravages of a Surrey summer! This entry was posted in 03.5 Unit 1 experiments, 04.3 Materials and process and tagged natural dyeing, plant dye on 25 May,2015 by antalbot.